Thursday, March 2, 2017 • 6:00–10:00 p.m. Experience First Thursdays (the first After Dark each month) where we focus on one topic—this time, Extended Cinema. 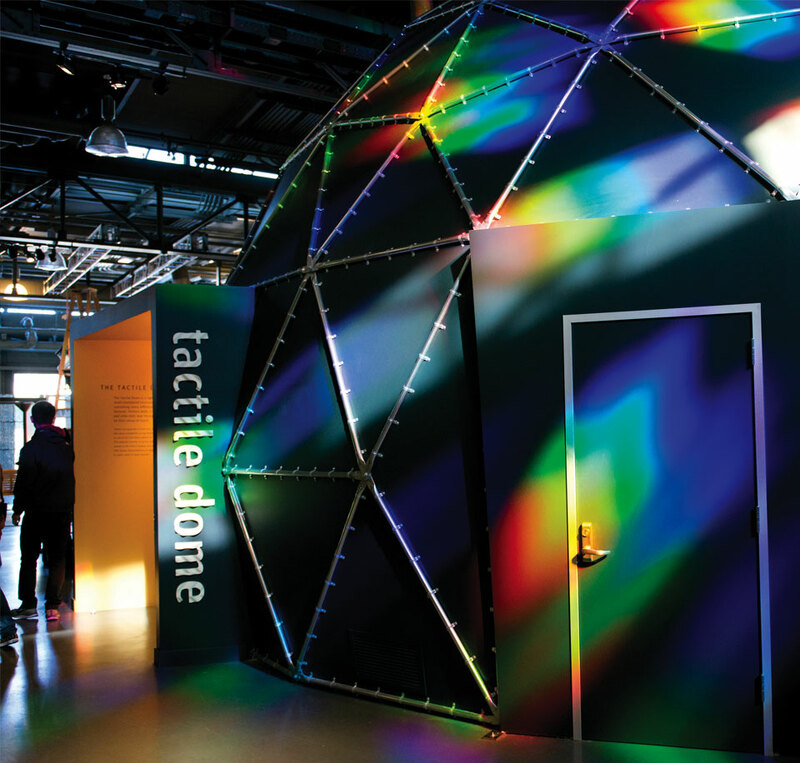 Also, grab dinner and drinks by the Bay, enjoy hands-on exhibits and demonstrations, and our pitch-black Tactile Dome. The warm glow of the projected image invites us to in-between worlds. During this cinematic celebration, now an annual favorite, the passive act of watching turns to listening, peering, touching, and interacting as Exploratorium Cinema Arts takes over museum spaces to provide experiences—both on and off the screen—created by artists and filmmakers from the Bay Area and beyond. As the costs of moviemaking tools declined after World War II, cine-clubs, where amateur filmmakers and enthusiasts could gather, proliferated in cities and small towns alike. The films that emerged from these postwar clubs displayed unbridled creativity and often revealed unexpectedly playful sides to their otherwise buttoned-up creators. Join cinematic innovator and force of nature Cory McAbee for the world premiere of his live sci-fi event, Deep Astronomy and the Romantic Sciences. Presented as a performative lecture, complete with a PowerPoint presentation including song, animation, and original artwork created for this event, Deep Astronomy and the Romantic Sciences explores topics such as deep astronomy, trans-dimensional drifting, time perception, the proper way to view the universe, and the reason that humans exist. It’s official: Since a 2011 Supreme Court ruling (Brown v. Entertainment Merchants Association), video games are art. Tonight we highlight video artworks that use gaming technology, independent games made with artistic intent, historic games revealing creative design and narrative experimentation, and popular games with a truly cinematic visual and narrative scope. Hear Marie Foulston, Curator of Videogames at the Victoria and Albert Museum in London, recount her strange and wonderful journey in curating independent video game parties in the depths of dingy nightclubs—as well as the hull of an ex–Cold War fishing vessel—and discover some of the wild and mischievous games she met along the way. Set in the Bay Area, Ubisoft’s WATCH_DOGS 2 sees a hacker traversing a stunningly cinematic cityscape in his efforts to expose corrupt corporations. Crafting the game’s vast open world led its creative teams on a multiyear process that dug deep into a study of the city’s unique shapes, sounds, textures, and people. Join Audio Director Olivier Girard and Art Director Sidonie Weber to explore the creative process of designing a vibrantly authentic and lived-in Bay Area from the ground up. At the Internet Archive, a nonprofit online library hosting webpages and media, you can run tens of thousands of historic games in your browser. This process runs without any installation or plug-ins, and allows almost instant access to information previously locked away on floppies and CD-ROMs. Get to know this approach to game history as well as the general goals of the Internet Archive, whose Wayback Machine provides millionswith daily access to historic websites. Step right up! Everyone’s a winner at the Cinematic Carnival. SEE a never-repeating selection of artist-made films from Canyon Cinema and the Exploratorium collection. MARVEL as artists perform innovative work. BEHOLD tinkerers demonstrating radical devices. And EXPERIMENT with simple to complex tools to create your own cinematic wonders. Tired of wondering what you could look like as the star of an infinitely adaptable, generative video signal? Wonder no more and take seat at Kit Young’s Selfless Analog Selfie Station to see your image merged and submerged in video feedback and video synthesis. Adapted by artists since the 1960s, video synthesizers use a signal generated directly by the synthesizer or an input image—or both—to produce infinitely variable patterns and abstract images. Drawing from the traditions of shadow-puppet theater, psychedelic light shows, and mixed media installation, Lydia Greer offers a behind-the-scenes glimpse at the visual layers and handcrafted details that merge in her work as Artistic Director of Facing West Shadow Opera. In this artwork by Exploratorium Exhibit Designer John Berzins, a tethered film projector moves along a circular track of celluloid, projecting a home movie onto its portable screen. As the evening progresses, dust and dirt cloud the projector, causing images to deteriorate or intensify, much like the memories revisited on film. You are the projectionist in this interactive installation by Kerry Laitala. Using a flashlight and magnifiers, create your own projections through handmade 35mm film strips from Laitala’s Golden Gate Award–winning Muse of Cinema series while a monitor screens short excerpts from her films Phantogram (2008, 16mm), Conjuror’s Box (2011, 35mm), Torchlight Tango (2005, 35mm), and Muse of Cinema (2006, 35mm) running in real time, at 24 frames per second. 4th Wall is an interactive environment encouraging hands-on exploration of cinema's fourth wall, the screen itself. “Break” the wall by touching, pressing, and poking an interactive screen to orchestrate dynamic animations and soundscapes. 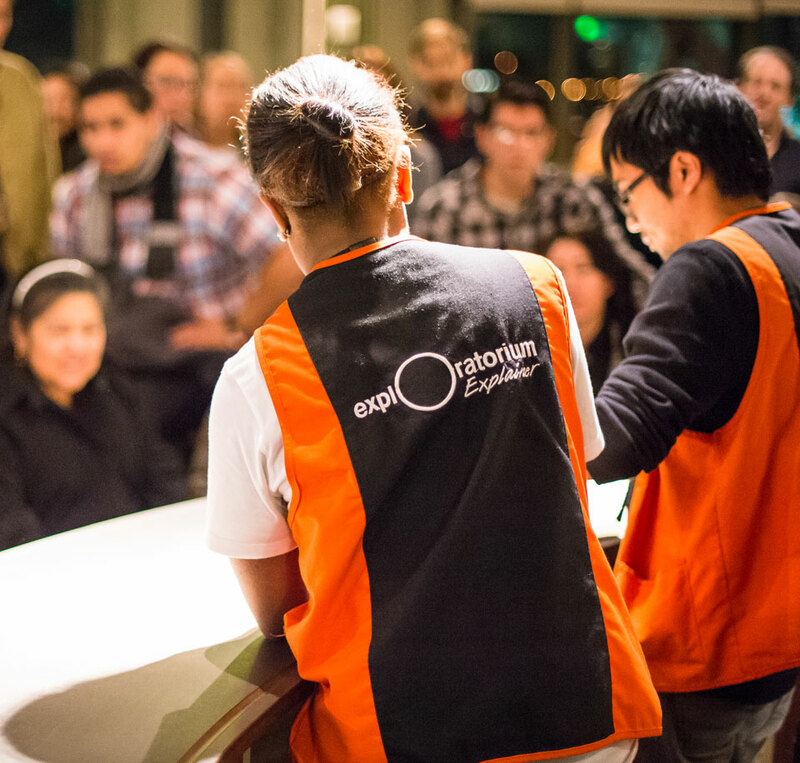 Since 1982, the Exploratorium has been home to a flourishing film program and ever-growing and evolving collection of artist-made film works. Stop and see some of our favorite shorts and get a feel for our core approach to cinema. Drawn from Canyon Cinema’s unparalleled collection of artist-made films, these micro-screenings are curated for the experimental cinema novice and cinephile alike. Drop in throughout the night to experience something new and unexpected with each change of the 16mm reel. Experiment with 16mm direct animation at this hands-on workshop. Use nails, dental tools, sandpaper, paint, and other tools to transform a 16mm film loop into a 5 second animated film. Paint on the celluloid, scratch into the emulsion, and let your creativity take over—while learning a little about analog filmmaking along the way. See your creations projected immediately and take your tiny motion picture home with you. A digitally enabled playground game, Johann Sebastian Joust takes a radical approach to video gaming in that it has no graphics. Played in a group where each person holds a motion controller, the goal is to jostle your opponents’ controllers while protecting your own, until you are the last player remaining. When the music—Bach's Brandenburg Concertos—plays in slow motion, the controllers are particularly sensitive to movement, forcing players to move carefully. When the music speeds up, the threshold becomes less strict, giving players a small window to dash at their opponents. If your controller moves beyond the allowable threshold, you’re out!